Today I have a guest post from my friend Julie who is the owner (but longtime editor) of the family travel website Road Trips for Families. 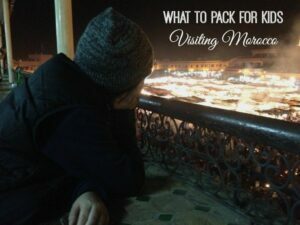 Julie came to visit Marrakech with her daughter last year and experienced our crazy city! 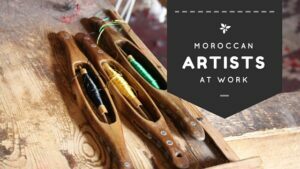 You can listen to her Moroccan adventures on this podcast episode. 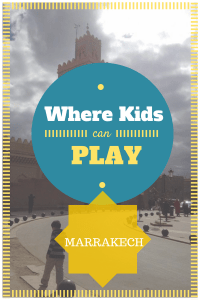 In this post she shares some of her tips for keeping kids safe when you’re in Marrakech. Whether you’re in the heart of the Magic Kingdom or touring the Louvre in Paris, nothing is more instantly terrifying than realizing your kids are no longer with you. A scenario that connects parents of all nationalities, hopefully these tips will help you establish some basic safety measures and adventure in confidence. I always like to take a camera phone photo of my kids before we head out for the day. This way, I’ve captured what they are wearing and have a photo handy to show or text/email anyone helping locate a missing child. 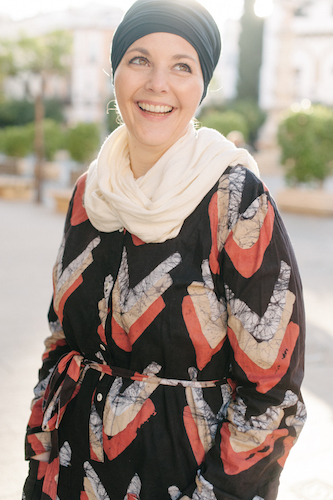 When we first arrived in Marrakech, the pulse of people, traffic, and commerce was overwhelming to this Midwestern gal from a one traffic light town. Cars and motorbikes zoom in close proximity to pedestrians and many of the shops and stalls. If you have kids that like to randomly bolt in the direction animals and toys, discuss the importance of staying on the sidewalk or close to an adult. I’m not above handholding, even if it is “totally embarrassing” for pre-teens. If you do not speak Arabic or French, communicating in Morocco will be somewhat difficult without a guide or friend like MarocBaba. I always like to write my name, phone number, and email address on a slip of paper and tuck it into my kids’ pockets (or shoe, if necessary). If your hotel/hostel has a business card with telephone and address in Arabic, grab a few to keep with you during the trip. On that note, establish an easy meeting point whenever you go somewhere new. Say, “If we get lost, meet me at this McDonalds, fountain, street corner (whatever).” You can also write the meeting point on the piece of paper with your contact information. In general, I tell my kids they can always ask another parent for help. Alternately, I suggest finding a police officer or anyone working inside a place of business. 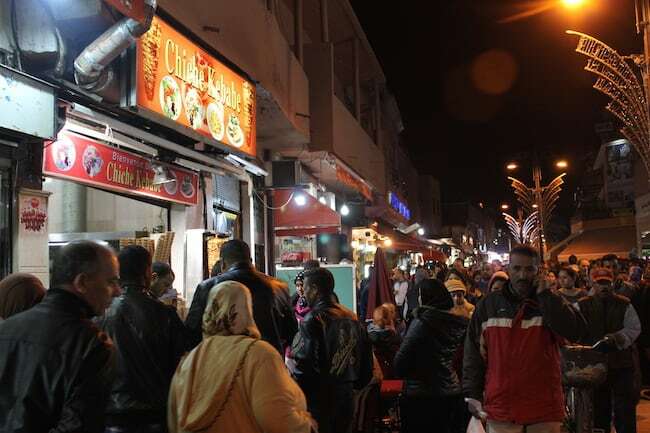 The Medina is a complex maze that gets particularly crowded at night. If your kids pose for souvenir photos with snake charmers, musicians, or monkeys, you will be expected to pay a small tip. Explain this concept to your kids and perhaps set a limit on how many photos you will take with other people. To my daughter’s delight, we counted upwards of thirty-three stray cats in one afternoon. While some of the animals are friendlier than others, try and discourage feeding, catching, and begging to adopt animals living in on the street. In general, I felt extremely safe during my time in Morocco. Most everyone we met was friendly and accommodating and exhibited a strong pride in their culture and nationality. 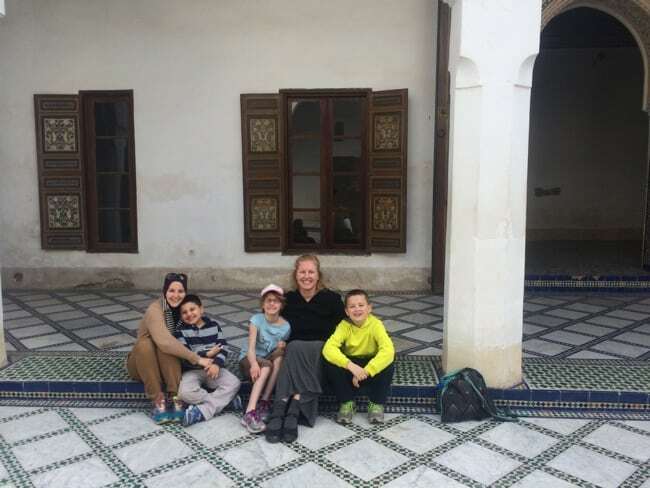 If you are thinking about traveling with your children to Marrakech, this is a cultural experience they will never forget. 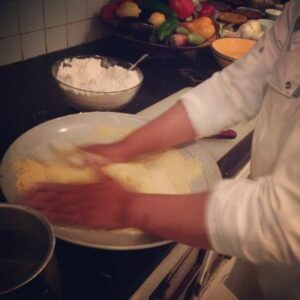 Learn how to make couscous with kids in Marrakech. Take an Artisan tour with your kids and get hands-on! 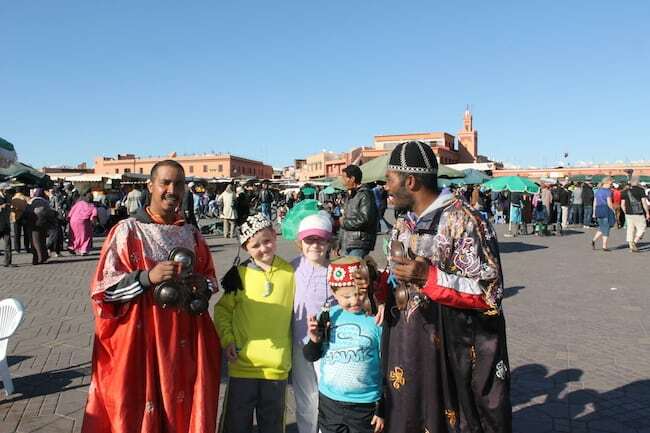 Great article, Moroccans love children, and some times it might get intimidating! Expect foreigners to be nice to your kids on the street, some times pet their heads, in the country side, they might even hold them and play with them. 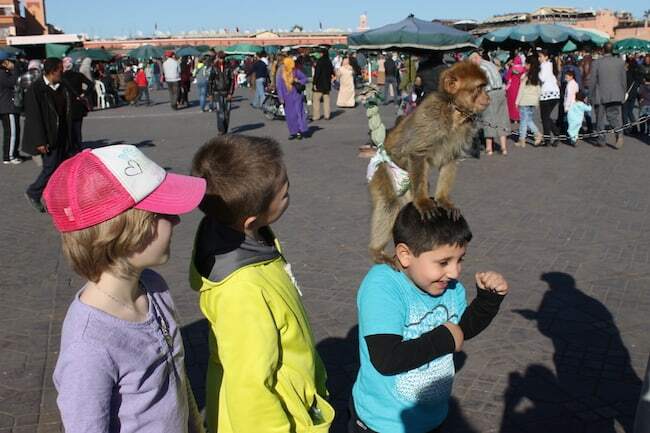 it is something normal in Morocco, and that’s a way for the locals to show their kindness to little children. Thank you very much for your post. I have a slight change to visit Morocco first week of December. Few things have to line up in order before I will know for sure but in a meanwhile I am heavily researching Marrakesh. 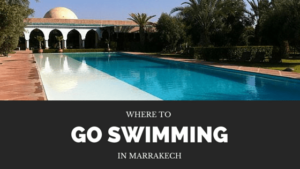 So far I have ran into several different posts and watched quite a few Youtube videos about Marrakesh and I am not convinced yet on whether to go to Marrakesh or to Tangier or just don’t go to Morocco at all. My biggest concern is the safety of my family (me, my wife and 5 year old daughter). We are experienced worldwide travelers (we already took our daughter to 17 countries and she is only 5) and many things that are typically scary and inconvenience for many others would not be an issue for us. Again, our biggest concern is safety. I’m working on a post that will go up today or tomorrow specifically about safety in Morocco. I will say this. We have lived here now for almost 3 years and visited for more than a decade. Morocco IS safe. I feel safer here than I do in the US where I am from. As for Tangier vs. Marrakech, they are VERY different places. Tangier is “Morocco light” honestly in many ways it doesn’t even feel Moroccan to me. It was an international city for a long time. Marrakech is a complete sensory experience. It’s loud, and chaotic. It’s got charm and headaches. I am not sure how long you will be here but here’s my two suggestions. If you go to Tanger; 2 days in Tangier, then visit Asilah, Chefchouen and maybe Fez. If you come to Marrakech; 2 days in Marrakech, 2 days in Essaouira, and then day trip to the High Atlas. speaking French, I always wonder how it is for English speakers, as I do realize many Moroccans don’t speak very well English and, when they do, the accent can be strange to young ears ! So thanks for the tips, I’ll keep them in mind. Precisely, maybe it’s my English, I would be much stronger regarding the topic “stray cats”. I’m a cat lover, but many stray cats here are invaded with pesters, parasites, have diseases, some can even have rabbies. Therefore, I go further than “not catching”, and for my side it’s even “not touching”, at least for the kids. My second point is about posing for souvenirs with monkeys or snakes. Please, just don’t do it ! Explain the kids these are wild animals that deserve a better life than being chained the whole day, without rest, in the middle of the crowd, thirsty, not well fed, not well taken care of. They are captured, most of the time illegally, in the wild. Many of the snakes are endangered species that are not allowed to be captured. They are cruelly maimed, having they tooths removed, and their life span is under six months. Excellent comment (above) on the monkeys and snakes. I had a sad feeling after seeing them and it’s a great teaching lesson, really.